Home Politics What's so offensive about a #CongresoCiudadano? What's so offensive about a #CongresoCiudadano? Tomorrow will be the launch of a new initiative inside the opposition, a citizens’ convention called the “Congreso Ciudadano.” According to its promoters, the idea behind the congress is to unite diverse elements of civil society and political parties inside the MUD and fan out a strategy for moving forward. Among its main backers are Leopoldo López’s party Voluntad Popular, Maria Corina Machado, Proyecto Venezuela, and Copei. The student movement has also said they will participate. The whole idea sounds pretty innocuous, right? Well, not so fast. Ramón Guillermo Aveledo, former head honcho of the MUD, has blasted it as some sort of elitist get-together. Henrique Capriles is boycotting the thing, and Julio Borges would rather eat nails than go. There is nothing harmful or sinister about holding a citizens’ congress, just as there was nothing harmful in Capriles’ embrace of the chavista Táchira governor (a gesture that caused a lot of grief for some people last week), or in any of a myriad of alternatives different actors inside the opposition are pursuing. Yet the trashing of the Citizens Congress is real, the latest in the petty turf wars aimed at deflating emerging leaderships within the opposition. Everyone seems bent on trying out different strategies … and shooting down alternative ones in the process. The whole dynamic going on in the opposition is so offensive to normal people trying to make ends meet, mourning the loss of a loved one, or worried sick about someone they care for who is rotting in jail, that it makes you want to give up on the lot of them. It strikes me as the last gasps of an opposition leadership that has failed to understand that the different currents inside the coalition need nurturing, not blasting. Do you want to know who in the opposition is boycotting unity? Look up those hoping for something as seemingly harmless as a citizens congress to fail. I think the time for gang warfare inside the opposition is over. Let the #CongresoCiudadano take place, pray for its success, and do your own thing if you’d like. Just stop preaching unity while blasting anyone who thinks differently from you. 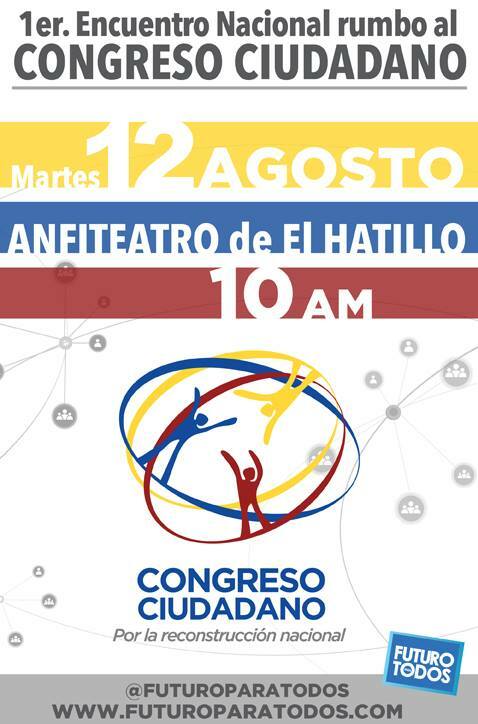 Here at Caracas Chronicles, we will be covering the #CongresoCiudadano, and enthusiastically rooting for its success while we ignore the naysayers. Lord knows we need new initiatives to flesh out a common strategy, and while the #CongresoCiudadano may well turn out to be a flop, at least it’s something.